The Word of the Week seems to have been Meat. 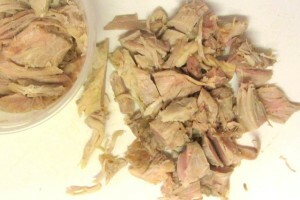 So, as well as the ham I have already mentioned, I had a pork shoulder to cook mid-week. Sometimes I just cook it plain, but this time I used the recipe I posted, with seasoning. And then, after the meat was cooked, I returned the bone and scrap to the pot with the liquid, added more water, and cooked that overnight. 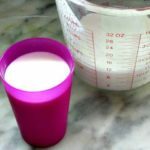 In the morning I pulled out the bones and chunks of fat and rind, poured off about a quart of broth for later use, returned the rest to the pot still with a little meat, and added a pound of soaked pintos, and enough water to cover. They were cooked by dinner time. This brings up something I haven’t really talked about. 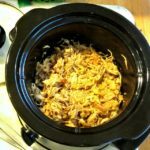 You may have noticed in my What I Ate Wednesday posts that we often eat some combination of beans and meat, though more of my recipes have been for one or the other. 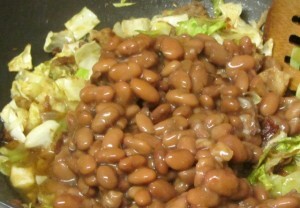 For many years I ate very little meat, and I still don’t really want a lot, but beans alone aren’t working for me, now. I don’t want to eat as many as I need to get enough protein… and Rich doesn’t feel quite satisfied with just beans, and… we don’t seem to have been cut out for vegan meals. A meal of beans with a little animal protein, though… that feels right. Sometimes it’s cheese along with the lentil soup, or a hard cooked egg in black bean soup – but often, for us, it’s a small amount of meat simmered with the beans. The end result? Not many vegetarian meals – but across the board we eat less meat than we would if we did Meatless Monday, but all meat every other lunch and dinner. 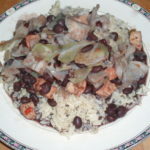 And that is the traditional way of eating in most cultures… Rice and beans with a small serving of meat through all the Hispanic cultures of the Americas. Dal and dairy and/or meat all over India. 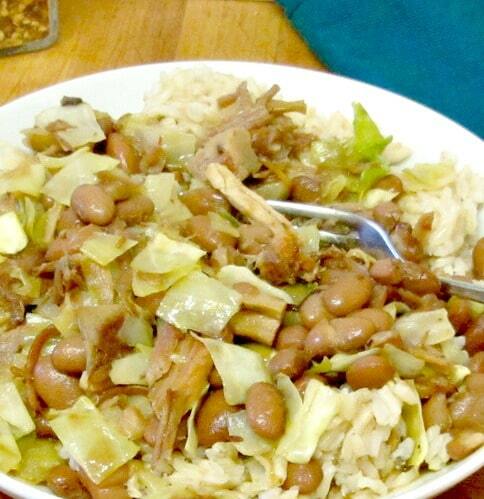 Tiny amounts of meat or tofu or red beans or fish in several different dishes in one meal in China. Pork rind in the baked beans in New England. 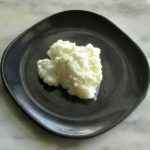 The meat (or dairy or egg) is there (when people can afford it, which is another story) but in small amounts, adding richness and flavor (and increasing protein) but not insisting on center stage. And you can change the balance. 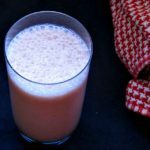 In this recipe, protein comes equally from the meat and the beans – but more often I use more beans and less meat. You can absolutely do that here. 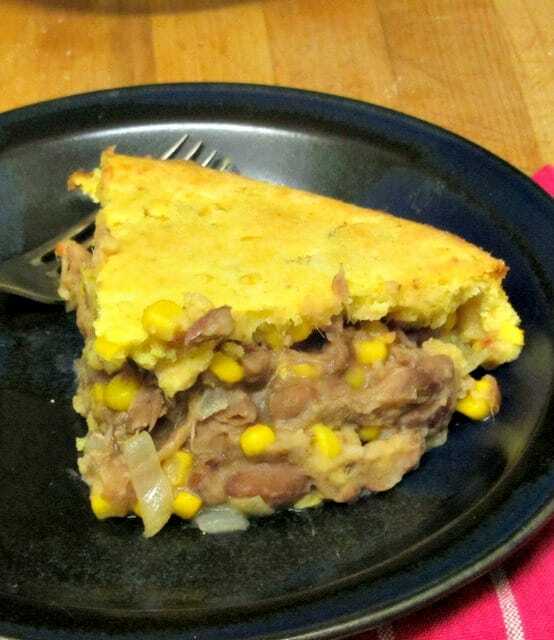 Or use more meat and less beans. Or skip one or the other all together, really… though that changes the dish. 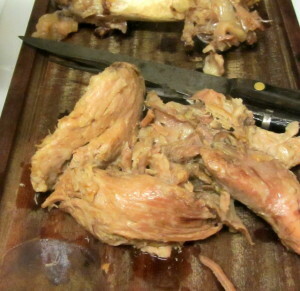 So, anyhow… here I was with cooked pork and pintos. And dinnertime was coming up. 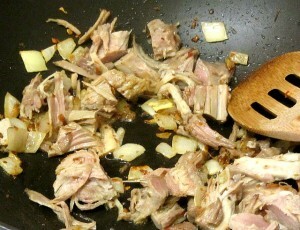 I took about 4 ounces of pork, and chopped it into bite sized pieces, and added them to the pan. Now, I chose to saute them for a few minutes to crisp the pork slightly, but that is purely optional… I took some time over this, but you can really just throw it all in a pan and it will still come out pretty well. While it heated, I chopped the cabbage. Um – a wedge? 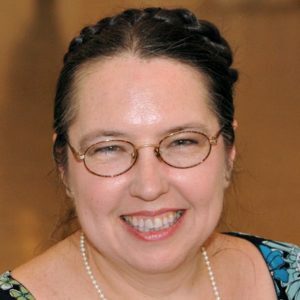 a chunk? Hard to measure cabbage… it was probably a bit over 2 cups of bite sized pieces. I dropped that into the pan and stirred it around to coat it with seasoning. Then I added about half a cup of the broth from the fridge – you notice what a firm jelly it was. Lots of flavor and nutrition. 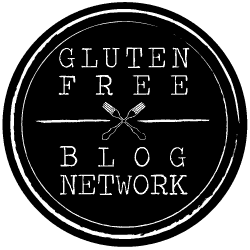 If you don’t have homemade broth, though, you can add a bit of chicken broth, or even water. So there you are. 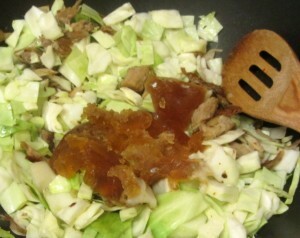 It’s really hardly a recipe – throw cooked food and cabbage in a pan, stir, heat until the cabbage is cooked, eat. But when I mentioned it online, half a dozen people Liked it… and you know, it really is good. 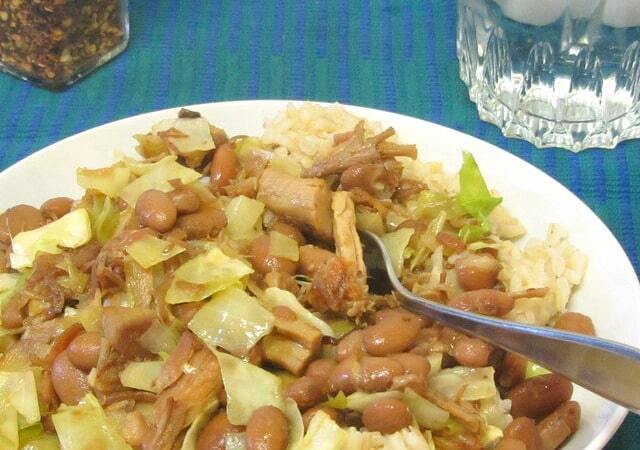 The flavor of the pork and the seasoning permeates the beans, the cabbage retains a bit of crispness to set off the soft beans and tender meat, and you eat it and remember why there is nothing like real home cooking. 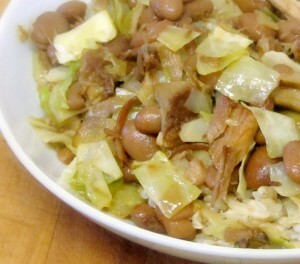 Pork and pintos - slow cooked pork, and seasoned beans, combined with cabbage in a rich, flavorful stew. Simple home cooking at its best. Saute onion and seasoning in a large fry pan. Add the pork, and stir. Saute for a few minutes. Add cabbage. Stir to coat with seasoning. Add broth. Add beans. Stir in, adding more broth if needed. 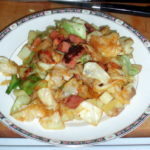 Simmer 10 minutes or longer, until cabbage is cooked and flavors have blended.